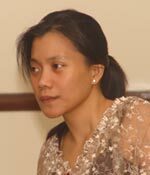 National Institute for Policy Studies (NIPS) board member and human rights activist Attorney Leah Olores leaves on October 13, 2005 for the International Human Rights Academy (IHRA) course in Cape Town, South Africa. The Friedrich Naumann Foundation through its International Academy for Leadership has included IHRA as part of its programs on promoting human rights. The Foundation is sponsoring this year’s seminar in conjunction with the University of the Western Cape. "Learning about the implementation of different human rights mechanisms will strengthen my work of protecting women and children's rights at the Department of Education," Attorney Olores said. "The course will better equip me in resolving cases as well as help me in formulating policies." IHRA is a human rights course organized annually and hosted on a rotational basis by Ghent University, the University of the Western Cape, Utrecht University and the American University.